Manila: The Philippine government has praised labour ministers in the Gulf for agreeing to adopt new contracts for foreign domestic helpers who seek employment there, a senior official said. “This is a boost to our efforts to ensure increased protection for the well-being, safety, and welfare for our Filipino domestic workers [who work abroad],” said Labour Secretary Rosalinda Dimapilis-Baldoz. She referred to the “new minimum terms on contracts”, which the six member countries of the Gulf Cooperation Council (GCC) — Bahrain, Kuwait, Oman, Qatar, Saudi Arabia, and the UAE — have agreed to impose on the employers of foreign domestic workers. The labour contract calls on employers not to confiscate passports of domestic workers, provide them with end-of-service indemnity and overtime pay for extra work for a maximum of two hours a day, paid annual leave and weekly days off, and the right to live outside the employer’s house. “Uncaring recruiters, opportunistic middlemen and abusive employers, who do not treat our household workers with respect and dignity as workers and as human beings with universal rights, should be penalised and banned from participating in overseas employment,” Dimapilis-Baldoz said. The new contract is a result of the Philippines’ commitment to promoting domestic workers’ welfare and protection, she said. 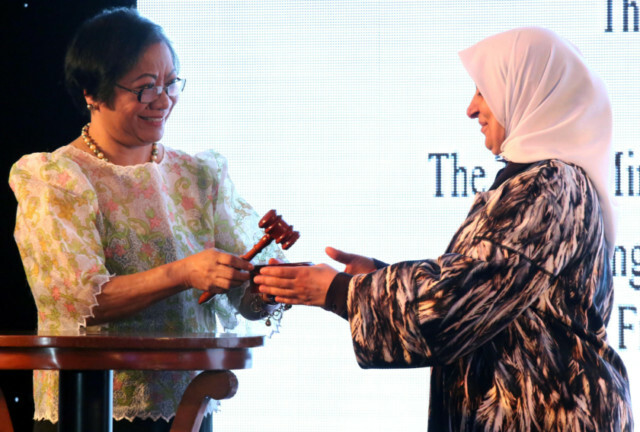 The improved labour contracts from the Gulf are in line with the International Labour Organisation’s (ILO) Convention 189, which calls for provisions of decent work for domestic helpers, said Dimapilis-Baldoz, adding the Philippine Senate ratified the convention in 2012. “These principles became universal after the ILO Convention 189 entered into force,” said Dimapilis-Baldoz, adding that it has set the platform for all countries to abide by the provisions of the convention. “I am very happy that the GCC has stepped in with the times and with the rest of the world in affording decent and productive work for domestic workers,” said Dimapilis-Baldoz. The Philippines is one of the biggest sources of foreign domestic helpers in the Middle East. There are 1.1 million Filipino workers in Saudi Arabia, the labour department said. It added that of the 10 million overseas Filipino workers (OFWs), 700,000 live in the UAE, and out of these 450,000 reside in Dubai. Considered as a special sector, the OFWs have been sending more than $26 billion (Dh95 billion) worth of remittances to their loved ones in the Philippines every year. The amount represents 15 per cent of the country’s GDP, the Central Bank said.